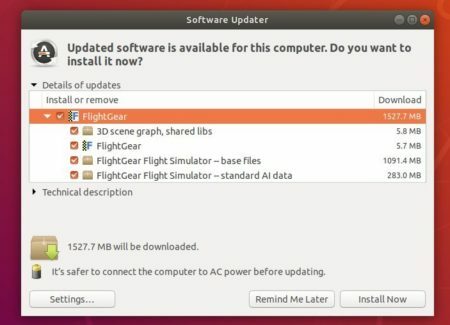 FlightGear flight simulator 2018.3 is finally available to install via PPA in Ubuntu 16.04, Ubuntu 18.04, Ubuntu 18.10, and Linux Mint 18.x, 19.x. FlightGear 2018.3 was released 2 weeks ago with new cloud lighting, better C-172p, new scenery Arctic island of Jan Mayen, and many other improvements. Type user password (no asterisks feedback) when it asks and hit Enter. 2. Then upgrade FlightGear via Software Updater, if a previous version exists. And launch Software & Updates -> Other Software tab to remove the PPAs. I tried this, and was able to install the files of Flightgear 2018.3.1. I see them in a folder in my directory. However, if I try to run the program from the LinuxMint menu, a blank window opens and that is it. I cannot find a way to run this program, even from the Terminal. I am very new with Linux, so please bear with me. Thanks. Have you tried using “fgfs” at the terminal?